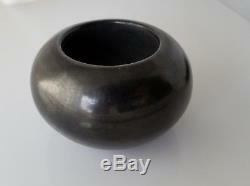 Authentic signed MARIA POVEKA (Martinez) Gun Metal High Polished BLACK BOWL. 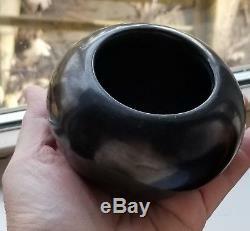 My father-in-law bought this bowl in the early 60s in Denver. He collected native American artifacts and pottery. He was in Denver on a business trip when he found two pieces. Maria Poveka Martinez - San Ildephonso Pueblo. 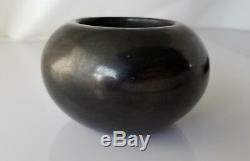 Fine Maria Martinez Pottery Bowl. 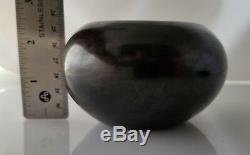 3 3/4" x 2 1/4" (approximately). Is probably the most famous of all pueblo potters. She and her husband, Julian, discovered in 1918 how to produce the now-famous black-on-black pottery and they spent the remainder of their careers perfecting and producing it for museums and collectors worldwide. By 1923, Maria began signing Marie on pieces made by her and Julian. His name was omitted because making pottery was woman's work. Pottery made by Maria and painted by Julian, signed Marie, was most probably made between 1920 and 1925. Pottery made by Maria and painted by Julian between 1925 and 1943 bears the dual signature Marie + Julian. By 1925, and until his death in 1943, Maria shared the signature with Julian. Following the death of Julian, their son Adam and his wife Santana helped Maria with the designing and firing of her pottery. Pieces made between 1943 and 1954 are signed Maria + Santana. When Maria began signing pottery, she was told, probably by Chapman, that Marie was a more familiar name than Maria to the non-Indian public. She therefore signed the name Marie for about 30 years. Following the publication of Alice Marriott's book, Maria: The Potter of San Ildefonso, she began signing her true name, Maria. 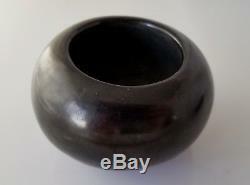 Around the mid-1950s, Popovi Da began working with his mother, helping her with designing and firing her pottery. They began to co-sign pieces Maria - Popovi, and Popovi started putting a date on each piece, probably around 1959. Maria often made small pieces of pottery without the assistance of her husband, her son, or her daughter-in-law. These are always highly polished, un-decorated pieces and are usually quite spectacular and graceful and exhibit the true nature of her genius. They are signed Maria Poveka. We have another piece of Maria pottery, a plate, that was broken by my mother-in-law. Look the photos over closely. As they are part of the description. Its hard to know what all to mention or even look for in vintage and antique pieces, as you might be searching for something I never noticed or thought of! Feel free to ask questions too! Please remember that vintage and antique items are treasure that have been lived with and loved for generations and will show signs of love and use. They may also have minor imperfections from all that love, use and time. Please dont expect these items to be perfect. We try very hard to point out imperfections, but sometimes you just have to search the photos for yourself. The charm and patina these items have gained over the years and the stories they tell are part of their charm! Check back oftenselling off several estates! 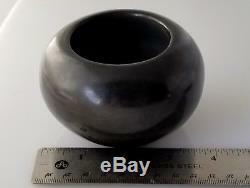 The item "Authentic signed MARIA POVEKA (Martinez) Gun Metal High Polished BLACK BOWL" is in sale since Friday, November 2, 2018. 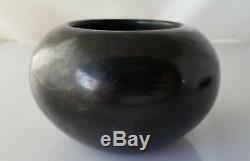 This item is in the category "Collectibles\Cultures & Ethnicities\Native American\ US\1935-Now\Pottery". The seller is "flyingpig" and is located in Grass Valley, California. This item can be shipped to United States, Canada, United Kingdom, Denmark, Romania, Slovakia, Bulgaria, Czech republic, Finland, Hungary, Latvia, Lithuania, Malta, Estonia, Australia, Greece, Portugal, Cyprus, Slovenia, Japan, China, Sweden, South Korea, Indonesia, Taiwan, Thailand, Belgium, France, Hong Kong, Ireland, Netherlands, Poland, Spain, Italy, Germany, Austria, Bahamas, Israel, Mexico, New Zealand, Singapore, Norway, Saudi arabia, Ukraine, United arab emirates, Qatar, Kuwait, Bahrain, Croatia, Malaysia, Chile, Colombia, Costa rica, Panama, Trinidad and tobago, Guatemala, Honduras, Jamaica, Barbados, Bangladesh, Bermuda, Brunei darussalam, Bolivia, Egypt, French guiana, Guernsey, Gibraltar, Guadeloupe, Iceland, Jersey, Jordan, Cambodia, Cayman islands, Liechtenstein, Sri lanka, Luxembourg, Monaco, Macao, Martinique, Maldives, Nicaragua, Oman, Pakistan, Paraguay, Reunion, Uruguay.